EURUSD tried to grow towards 1.175 on Tuesday but eventually it fell down towards 1.16 area. Powell’s speech regarding the assessment on the US economy supported USD. The support rests at 1.16080 with resistance at 1.16580 which both lines are below the weekly pivot point at 1.16970. The EMA of 10 is moving with bearish bias in the descendant channel and it is above the EMA of 200 and the EMA of 100. The RSI is falling towards the oversold area, the Stochastic is moving in low ranges and the MACD line is below the signal line in the negative territory. The ADX is showing strong sell signal. 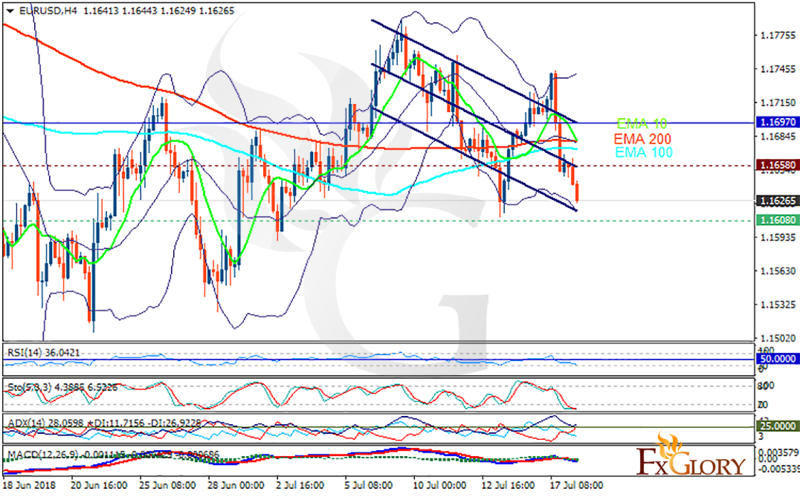 While 1.159 remains the floor for the market, EURUSD may be fluctuating within the upper and lower Bollinger bands.